Comparison of Laparoscopic Primary Repair and Open Repair Techniques for Small Ventral Hernias. Epigastric, umbilical, incisional, parastomal and trocar site hernias are all “ventral” hernias in surgical practice. The use of synthetic materials for repair of ventral hernias tends to be the golden standard. However, there are some situations where the use of a mesh is either unnecessary or contraindicated. Furthermore, these patients should still be given the chance of minimally invasive surgery. 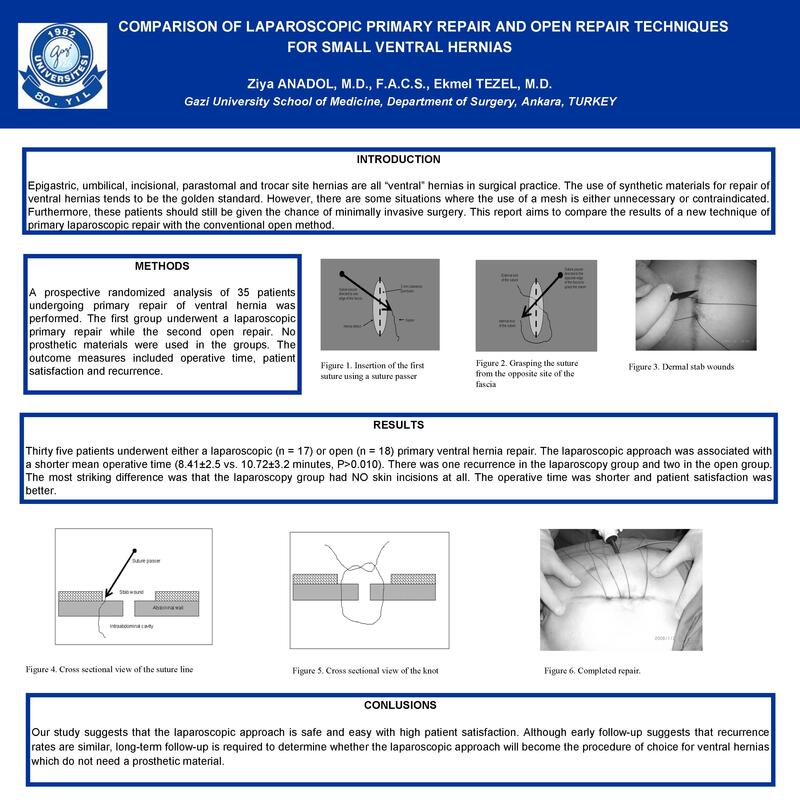 This report aims to compare the results of a new technique of primary laparoscopic repair with the conventional open method. A prospective randomized analysis of 35 patients undergoing primary repair of ventral hernia was performed. The first group underwent a laparoscopic primary repair while the second open repair. No prosthetic materials were used in the groups. The outcome measures included operative time, patient satisfaction and recurrence. Thirty five patients underwent either a laparoscopic (n = 17) or open (n = 18) primary ventral hernia repair. The laparoscopic approach was associated with a shorter mean operative time (8.41±2.5 vs. 10.72±3.2 minutes, P>0.010). There was one recurrence in the laparoscopy group and two in the open group. The most striking difference was that the laparoscopy group had NO skin incisions at all. The operative time was shorter and patient satisfaction was better. Our study suggests that the laparoscopic approach is safe and easy with high patient satisfaction. Although early follow-up suggests that recurrence rates are similar, long-term follow-up is required to determine whether the laparoscopic approach will become the procedure of choice for ventral hernias which do not need a prosthetic material.